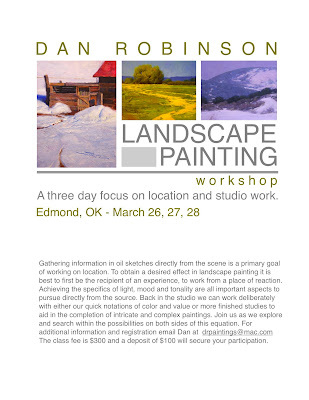 My next class will focus on landscape painting, working both on location and a day in the studio working from one of our location studies. Hi Dan! Wanted to thank you for your very kind comment on my painting. And wow, do I ever admire your work. So the compliment from you is humbling! I just realized that your workshop is in Edmund OK. Hey - I've been there! That's where my two very best friends in the whole world hail from. I'm speaking of my dogs, of course. At any rate - I'm adding you to my links list so that I can follow your work. Again - thanks for your kindness.